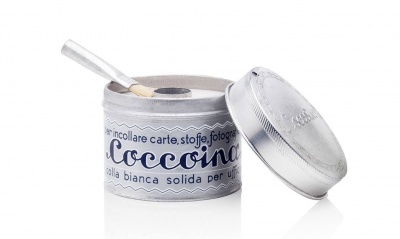 Coccoina natural glue is non-toxic and 100% plastic free. Made from potato starch, with a sweet almond/marzipan scent, try not to eat it! Comes in a recyclable metal tin and includes a little biodegradable brush with natural bristles. A non-toxic natural glue. This glue is 100% plastic free and made from potato starch, with a sweet almond/marzipan scent, try not to eat it! Comes in a recyclable metal tin and includes a little biodegradable brush with natural bristles. 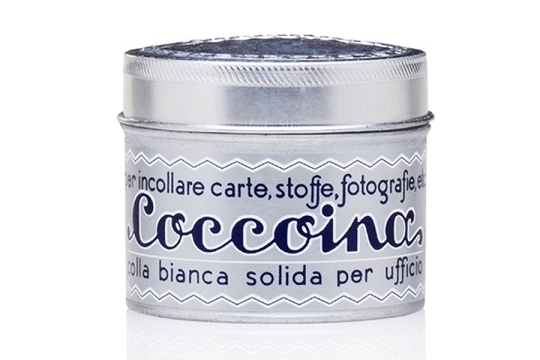 Coccoina natural glue is ideal for arts and crafts, mounting artwork or photos on paper or any of your child's interesting creations. This solvent-free glue is safe for children to use, it does not contain any acid, it is a non-toxic glue which is safe for you and the environment. It is 100% biodegradable and safe for composting. This natural glue is made in Italy, this glue was used in schools throughout Italy in the 1930s, it still has an elegant vintage look to the tin. It includes a traditional natural brush to make application easy and free from microplastic pollution. Coccoina natural glue can even be reused if you over apply. The glue can dry out but if you heat it in a pan and add a drop of water or two you can bring it back to its original consistency and use again. Ingredients - Water (55-60%), Dextrin from Potato Starch (35-40%), Glycol monopropylene (1.46%), Glycerin (0.88%) and almond essence. Packaging - Aluminum container, and a natural brush with pig hair bristles.